Save energy and money with this LED technology Solar Post Light. This sturdy traditional design is built of strong cast aluminum with a clear glass lens and includes a corrosion-proof square plastic planter base. The attractive LED filament light offers both a low 50 lumens and high 100 lumens light output option and 8 hours of operation run time on a full charge. The manufacturer warrants this lighting fixture to be free from defects in materials and workmanship for a period of two (2) years from the date of purchase. Closed top lantern with scalloped window frame and water glass sends long shadow reflections across porch and landscape areas. Made of weather resistant cast aluminum. Outdoor post top light fits standard 3 to 3 1/2 inch post top mounts. Includes hardware and installation instructions. The Gama Sonic Aurora GS-124FPW is a rust-resistant cast-aluminum solar outdoor light fixture in a powder-coated black finish. It comes with hardware for hanging the unit as an outdoor wall sconce, bolting it to flat surfaces, or fitting it on a three-inch-diameter lamp post (post not included). The Auroras internal Lithium Ion battery pack charges when sunlight hits the fixture's integrated monocrystalline silicon solar panel. The fixture is designed to provide 50 lumens of bright-white light from dusk to dawn when the battery gets fully charged by a days worth of sunlight. Extra benefits include Gama Sonic's patented light-enhancing cone reflector, panel protection with durable tempered glass, and a battery pack that should last for about 1,000 charges. For any product questions or unexpected issues, Gama Sonic support at our Atlanta headquarters is here to help. The Gama Sonic Baytown GS-106FPW-B is a rust-resistant cast-aluminum solar outdoor light fixture with an attractive finial and a powder-coated black finish. It comes with hardware for hanging the unit as an outdoor wall sconce, bolting it to flat surfaces, or fitting it on a three-inch-diameter lamp post (post not included). The Baytown's internal Lithium Ion battery pack charges when sunlight hits the fixture's four integrated monocrystalline silicon solar panels. The fixture is designed to provide 80 lumens of light from dusk to dawn when the battery gets fully charged by a day's worth of sunlight. You choose the LED colour tone with the flip of a switch: bright or warm. Extra benefits include Gama Sonic's patented light-enhancing cone reflector, panel protection with durable tempered glass, and a battery pack that should last for about 1,000 charges. For any product questions or unexpected issues, Gama Sonic support at our Atlanta headquarters is here to help. 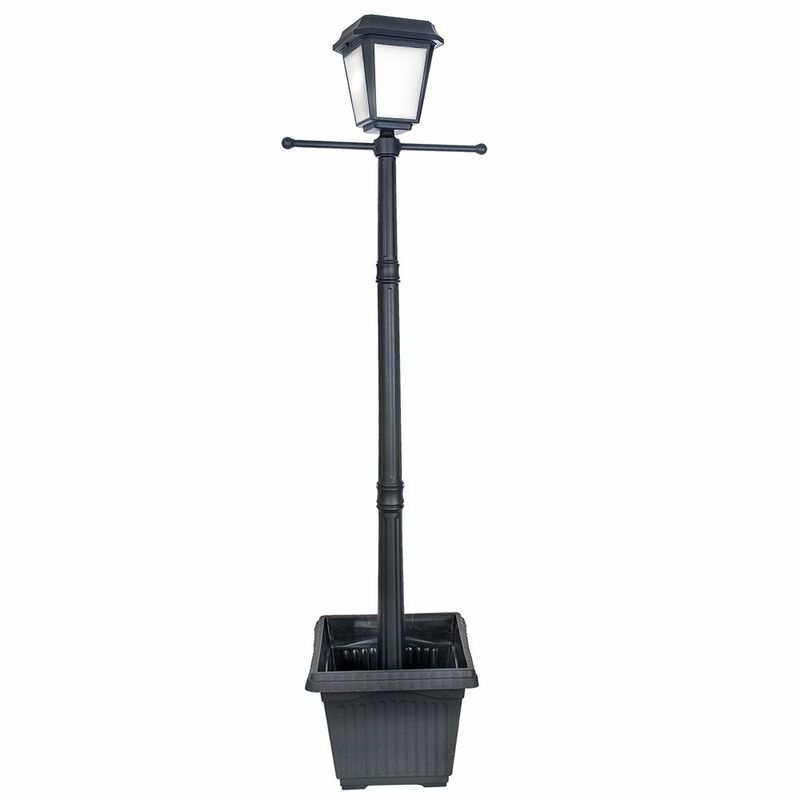 1-Light Black LED Solar Outdoor Post Light with Square Planter Base Save energy and money with this LED technology Solar Post Light. This sturdy traditional design is built of strong cast aluminum with a clear glass lens and includes a corrosion-proof square plastic planter base. The attractive LED filament light offers both a low 50 lumens and high 100 lumens light output option and 8 hours of operation run time on a full charge.